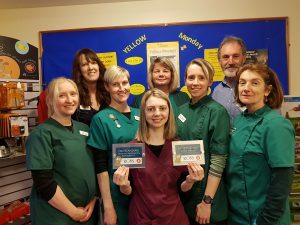 Here at Miller and Swann Veterinary Clinic we are very proud to have gained two awards from the Royal College of Veterinary Surgeons (RCVS). The RCVS are the governing body of veterinary surgeons, who teach and regulate veterinary surgeons to make sure they provide the best service possible. The awards held by the RCVS are to recognise outstanding achievement in all fields related to the veterinary profession. As a practice we have gained two awards: the RCVS award in Client Service and the RCVS award in Team and Professional Responsibility. Both of these awards were given at “outstanding” level – the highest level you can achieve. To the right of this article is a photograph of some of the staff members involved. Diane Leighton, the practice manager, said: “I am so proud of all the team here at the practice. I know that everyone here at Miller and Swann live up to the CVS ethos of being passionate about animal care.